▶ Apply the oil generously using a medium-sized paintbrush or small cloth. Allow it to be absorbed over 2 or more days, repeating if required. To maintain leather, use every 6-12 months to keep it luxuriously soft and supple. 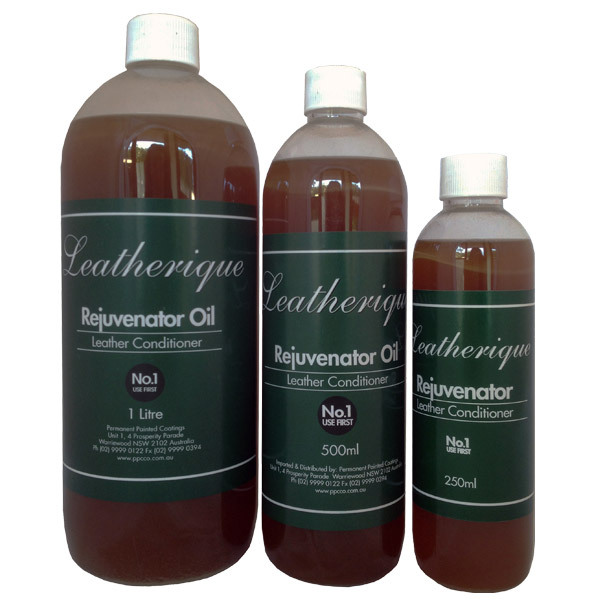 ▶ Leatherique Rejuvenator Oil is a leather conditioner that lifts dirt and pollutants to the surface while deeply conditioning and preserving your leather. ▶ Rejuvenator Oil is not a surface dressing as are many leather treatments. It contains no wax or petroleum distillates but is simply nourishment for the actual leather fibers (including pH-correct Collagen and fat liquors). ▶ Maintaining the full-depth condition and cleanliness of the leather is what keeps it looking good, feeling good, and lasting for many generations. Are you using other products? ▶ Silicone oil or sealers that harden the leather surface and promote cracking. The leather loses its ability to "breathe", which is what makes it so comfortable to our touch. ▶ Beeswax - great for saddles and boots where waterproofing is desirable, but gives a clammy feel when used on leather car seats and leather furniture. ▶ Petroleum, mineral, neatsfoot, or lanolin oils, which can encourage rotting of leather fibres and stitching.